Digital Pictures / Images now a days, is a part of everybody’s life, especially for the people owning Smart Phones and using the Social Media Networks. There is a race among the people to collect the best Smart Phone, packed with the high resolution camera. It’s acceptable if we talk about the clarity or sharpness of the picture, but what about the file size of the images. After all, the primary purpose of that images will be to share them on the social media networks using the high data charges. Majority of the population is still using the 2G networks on their mobiles phones to access the internet, do you think the 2G mobile networks are capable enough to transfer these big image files. To tell you the truth, any picture file of 60-70 KB is the best for sharing purpose to any network, it will use less internet data while sharing and will also consume less space on the internal storage of the mobile device. Don’t worry, Today we are here with the solution to reduce image size by 60-70% without compromising with the quality of the image. You don’t even need any tool or third party app to reduce image size, you only have to use the online web service known as WebResizer. Although, the high resolution cameras in the mobile device comes with the option to save the output image file in normal, best or excellent resolution, in all the cases the output image file will be of 1MB at least. Why to waste 1MB of the expensive internet data or limited storage space of mobile device, when a 60-70 KB image file can satisfy all our needs. Have you ever thought about, how long the limited storage device of your phone will allow you to save these big image files, sooner or later it will ask you to delete the previous one’s. By this act, you are not only wasting your’s expensive internet data, you are wasting other’s internet data too as they also have to download it to have a look at your picture. The person at the receiving end can’t do much about that, but you can do a lot by optimizing all the images before sharing / sending them anywhere. People involved in the web development or the blogging field can’t ignore this by any mean, big image files will surely increase the load time of their blog / website and will waste the valuable bandwidth too. In simple words, if you ignore to reduce image size, it will just waste your hardly earned money, directly or indirectly. 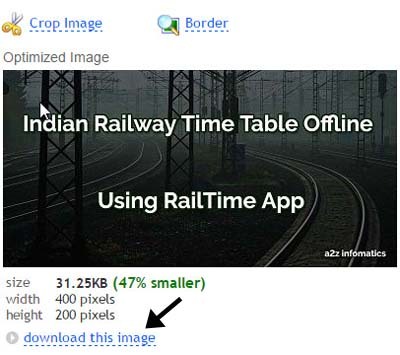 To reduce image size, people normally use offline tools / Softwares. The most common Software to do the job is Adobe Photoshop. Here, we want to make it clear that Photoshop is one of the best image editing software available in the market, our favourite too. In Adobe Photoshop, to reduce image size, we have to reduce the image dimensions, which in return reduces the image quality too. On the other hand, in the case of WebResizer, it reduce image size without effecting the quality of the image. 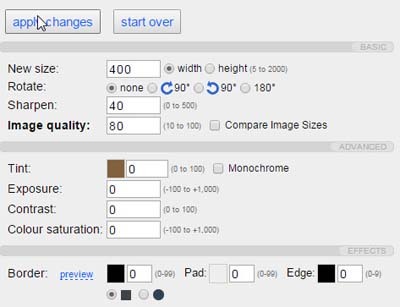 This may sound unrealistic to many of the people, but actually this is the amazing ability of this light weighted online tool to reduce image size. 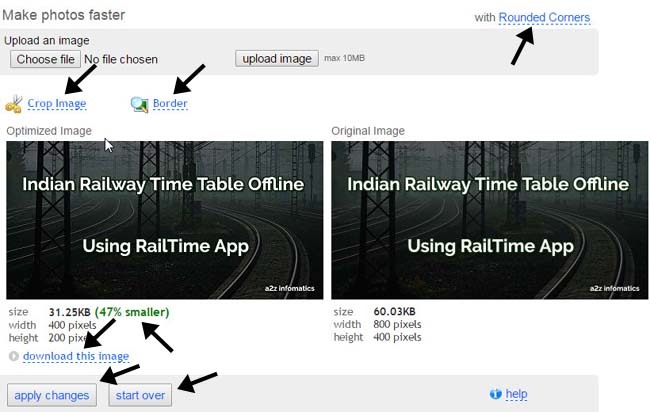 Below is the complete demonstration about reducing the image size using the wonderful WebResizer online tool. How to Reduce Image Size using Online WebResizer Tool. Before we proceed to demonstrate the doings, let’s have a look on some of its mind blowing features. Using WebResizer, you can reduce image size upto 60-70% in majority of the cases, 20-30% in some exceptional cases. The other best thing about WebResizer is that, it accept almost every image format, you can demand to optimize any of your jpg, png or gif image file, you can even crop or apply the borders to the output image file. In addition to these features, you can also demand the output image file with any particular dimensions, with custom sharper and image quality values. Beside this, there are more custom values you can adjust for the output image file, like tint, exposure, contrast and colour saturation. In simple words, WebResizer is the all-in-one tool for optimizing any of your image. Let’s move to the simple steps to get it done. Steps to Reduce Image Size using WebResizer. 1)- Open any of your preferred internet browser and type “http://webresizer.com” into the address bar and Hit the ENTER key. 2)- Here, you will find the “Resize Photos Here” button, click to it to get inside the main window to reduce image size. 3)- Now, Click to the “Choose file” button and supply any image file, you wish to optimize. After that click the “upload image” button and wait for some seconds to get it processed. 4)- Once the image file is uploaded to the WebResizer server, you will preview it there. 5)- Now, leave it to default OR do any customizations according to the needs and HIT the “apply changes” button. Note: If something went wrong while doing the customizations, you can any time use the “start over” button to start the optimization process from the beginning. 6)- At last, if you are satisfied with the customizations, HIT the “download this image” link to download the optimized image file. Important: If you like, you can CROP or apply the BORDER to the image, you wish to optimize. You will get the instant preview of the customization you select for the image. To convert the image in the black and white format, just check the Monochrome box there at the main page. To round the corners of the output image, use the Rounded Corners option any time. You can also try their BULK Image Resizer tool to optimize the multiple images at once at “https://bulk.webresizer.com”. Congo!, You have successfully optimized the image file you requested. Use it anywhere, without worrying about the data charges and the limited storage capacity of your mobile phone. 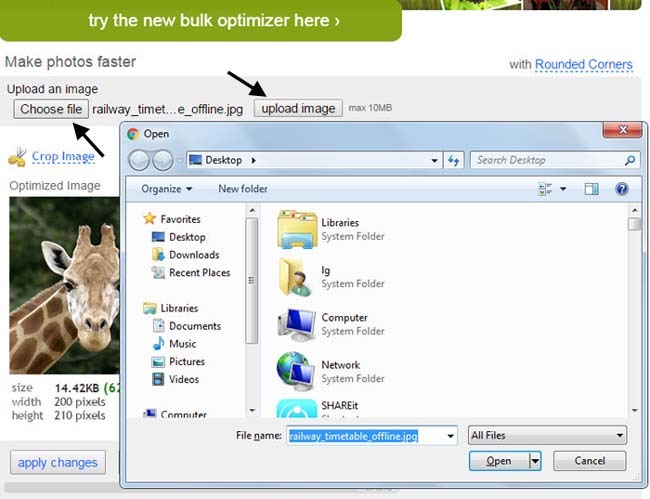 You can Optimize any of the images at WebResizer using desktop computers or mobile devices. If optimizing the images using the mobile devices, just make sure that you are not accessing the WebResizer website in the Google WebLight mode. Beside all the wonderful features of the WebResizer tool, below are some limitations while using the WebResizer Tool. Limitations while using the WebResizer Online Tool. For some png files, the size of the optimized output image file is not up to the mark. At present, rounded corners option is not available for the gif image files. There are some problems with the border tool, if used at any transparent image. You May Also Like: How to Find – Delete Duplicate Photos in Mobile Phones. 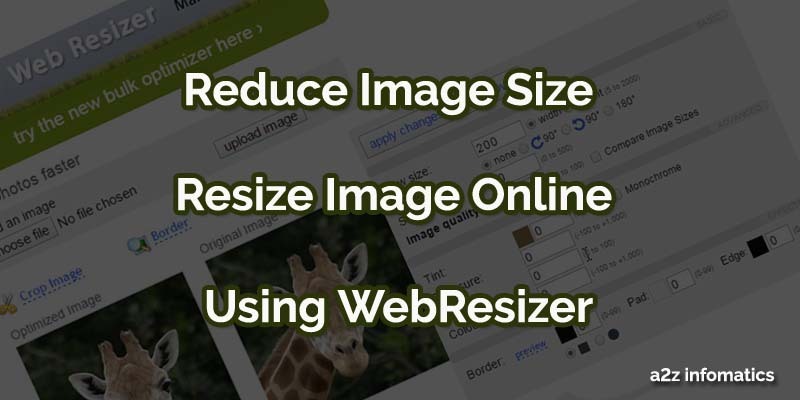 Today, You people have learned to reduce image size using hassle free WebResizer Tool. Believe us, using the above tips to optimize your images, will surely cut off the internet data charges to a great extent. In addition, you can keep the previous images for the longer period in your mobile device. Don’t you think, it’s very useful for the Smart Phone users with the limited storage capacity. Do share your view about image optimization under the comments section below. That’s all we have related to the subject, we will be back with many more time and money saving tips. Till Then, bye bye, Stay Blessed and keep visiting a2z infomatics.